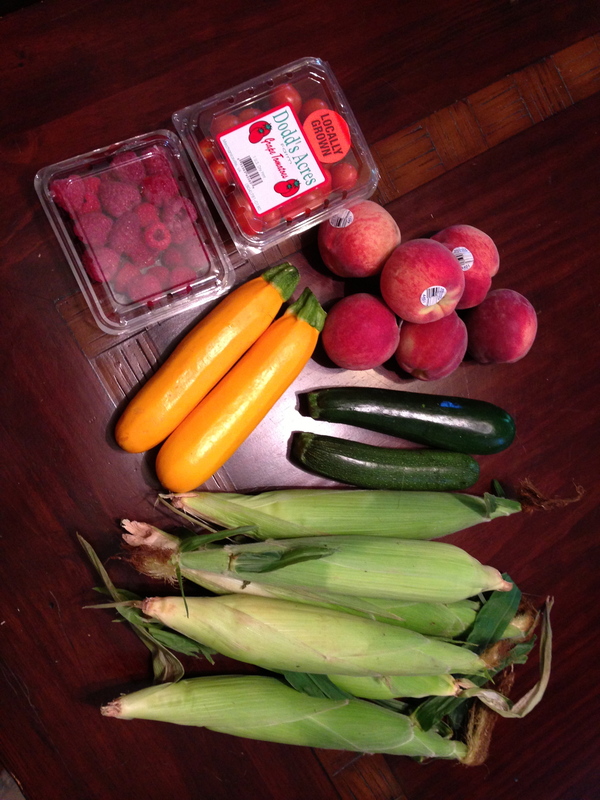 Last week, I was wondering about what kinds of fruit would be included in the Summer CSA. This week, I found out. We got 6 local peaches and a container of raspberries! Mmmm. The peaches sitting in the fruit bowl ripening as we speak. We also got 6 ears of white corn, 3 of which have already disappeared after being boiled and topped with a little butter. The bag also included some locally grown cherry tomatoes (to be enjoyed with some mozzarella and pesto), zucchini, and yellow squash. I’ve made a stew for G with one of the zucchini and yellow squash that was pretty tasty – chicken, zucchini, yellow squash, white sweet potato, onion, chicken broth, rosemary, and thyme. I may make some zucchini pancakes with the remaining zucchini but I may just roast it and the yellow squash and have them in a salad. This hot weather makes me want to eat simple (and chilled) foods. We’ll see if I get inspired during the week.